It's my humble opinion the best Football Video game going right now is Tecmo Bowl. Yep--Tecmo Bowl. A team of dedicated hackers/code jockeys over at TecmoBowl.org yearly update the NES classic to suit the most current NFL year. 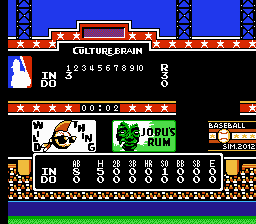 In game graphics also received an overhaul, mostly scoreboard graphics changed to suit my tastes. Can't have a baseball game without a few Major League references, no? 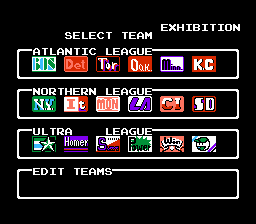 (Aside from Wild Thing and Jobu, Baseball Simulator 2012 includes one other Major League-inspired easter egg) And of course, one can't update a game without putting some polish on the title screen. Anyone needing directions on how ROM patching works or how to properly emulate this game (legally) on your computer, head over to romhacking.net. Also, like our friend Roger Clemens, I maintain I'm innocent (until proven guilty) of juicing... the Indians stats. * Don't even talk to me about Baseball Stars or RBI Baseball. 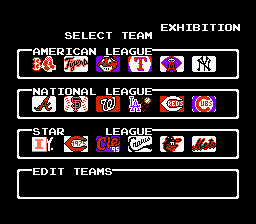 In terms of graphics, gameplay and overall feel, Baseball Simulator 1.000 beats the competition to a pulp. 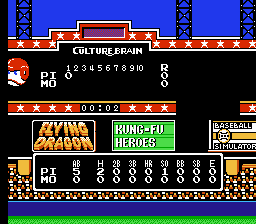 It's the most Tecmo Bowl styled Baseball game for the NES. Thanks! 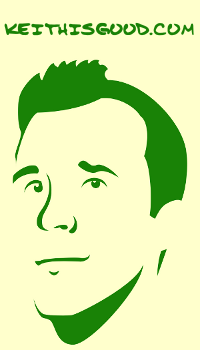 Still a few tweaks to be done, but I'm pretty happy with it. Big fan of your work, BTW; loved the most recent Castlevania III ep. (Didn't read the name on your comment until just now). If you ever need to bring in a ringer on Blades of Steel or Baseball Sim, you know where I'm at. There any way you can link to an actual how-to on how to patch this? The site you linked may as well be in gibberish. 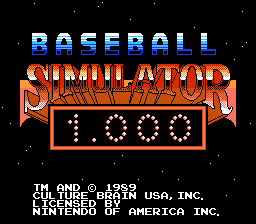 download an application called Lunar IPS and a ROM of Baseball Simulator 1.000. 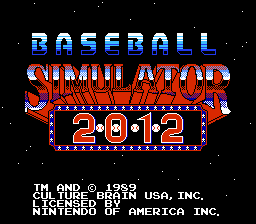 Open Lunar IPS and follow its prompts: first choosing the ROM file, then the Baseball Simulator 2012 ips file. That should do it for you.